How to Troubleshoot a Dual Flush Toilet. A dual flush toilet gives you the option of using a little over 1/2 gallon of water to flush liquid waste and approximately 1½ gallon of water to flush solid waste. 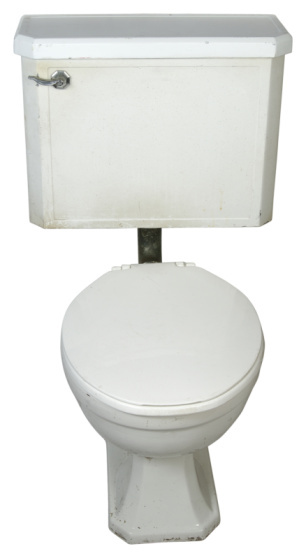 This economical toilet can save quite a bit of money and water over its lifetime. You can troubleshoot your dual flush toilet using these tips before calling a plumber. Adjust the tank water level if the toilet is not flushing properly. To add more vigor to the flush, fully open the water supply shut-off valve. Make sure the tank water level is the same as the waterline in the toilet. Troubleshoot the plumbing. Make sure there are no obstructions in the pipes. Not only should the drain be running free, but also the jet holes should be clean and the vent pipe shouldn't have any obstructions. Connect the flush ball chain to the trip lever if the toilet doesn't flush. Make sure there isn't a lot of slack in the chain. Check the seals on the flush ball if the toilet sometimes flushes by itself or runs water at odd times when no one touches it. Replace the flush ball if necessary. You may also need to replace the flush valve if it is worn, misshapen or dirty. Make sure to align it properly with the hole when you reinstall it. Flush the lines if the tank takes too long to fill. Open the water supply shut-off valve to allow full pressure to fill the toilet. Reduce the amount of water flow to reduce a noisy tank fill. Turn the water-supply shut-off valve back a bit to reduce some of the water pressure. You may have to make a couple flushes to get the water supply just right as you troubleshoot this step.